Look ma - no fan! Want an easy extra 5 horsepower, 2 or 3 more MPG, less noise, and smoother running? Then get rid of the engine-driven cooling fan! A compromise between overheating at idle and wasting power at higher engine speeds, the only thing the '02's stock engine-driven fan has going for it is that it is reliable. A thermostatically-controlled electric engine fan will give better cooling at idle, more power at high rpms, smoother and quieter operation overall, faster revving, longer water pump bearing life, and slightly quicker engine warmup. 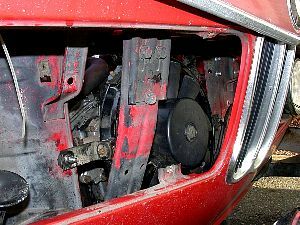 On an '02, removing the engine-driven fan will reduce the likelyhood and severity of radiator damage should your motor shift forward a bit, too... 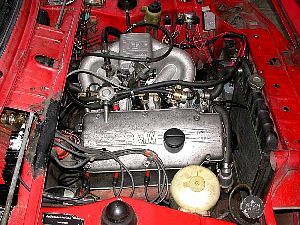 The one major caveat is that an electric engine fan will substantially increase the draw on the wimpy '02 electrical system - the fan I used draws about 27A when first starting and 18A continuous current. So, while not absolutely required, this mod is best done in conjunction with an alternator upgrade. There are many aftermarket and junkyard/OE fans that can work in this application. 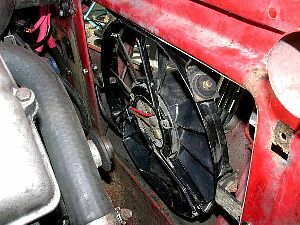 Whatever you find, it will have to be a "pusher" type of fan that is designed to sit in front of the radiator since there is very little room between the engine water pump pulley and the back of the rad. I used a salvaged E21 320i auxiliary fan (as found on A/C equipped cars). It is a heavy-duty, OE-quality Bosch part and has the major bonus of coming with some nearly-ideal rubber-isolated mounting brackets. It is about 13" in diameter which is just the right size for the '02 rad. Fan is mounted as close to the rad as possible. Most "universal" aftermarket fans come with hardware that mounts the fan directly to the radiator core. While convenient, this is usually very hard on the rad and can lead to core leaks. A much better way is to mount the fan to the chassis which is why the 320i fan is a good choice. Other than needing to re-work the upper brackets, this fan fits almost like it was originally designed for an '02 - the fan and shroud make no contact with the rad but are still held very close to the radiator core so air is not spilled away. 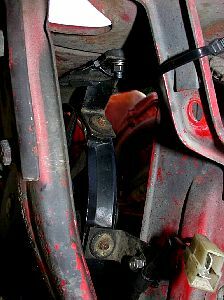 The rubber isolators in the brackets reduce fan noise in the cabin. I had to use short spacers so that the brackets could neatly clear the edges of the opening in the radiator support bulkhead. The rubber spacers were quickly made up of slices of fuel line inside slices of heater hose. 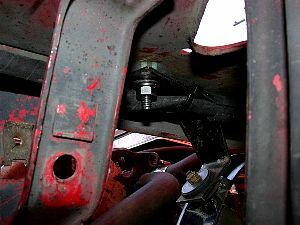 The fan's upper brackets were bent to bring the mounting bolt hole forward on the car and to lower the fan about 1" so it is not eclipsed by the bulkhead. I noticed that the large drain plug on the left side of a late-style '02 rad just happens to have a 14mm thread that matches the '02's temperature gauge sender and is in the perfect spot. Temperature sender installed in rad tank. that won't work for this sensor. This sensor location is ideal because the bottom of the rad is exactly where you want to measure the temperature for controlling the fan. Only when the coolant exiting the rad (out the bottom hose) gets too close to the engine operating temperature do you need to turn on the radiator fan. 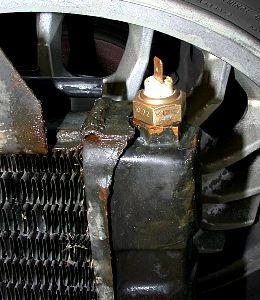 If you put the fan control sensor in the radiator's upper hose or on the engine's coolant manifold (both places where the coolant is always near the engine operating temp), you'd have to set the on-point such that the engine will either have to start to overheat before the fan will be triggered, or the fan will run almost all the time. To be able to make use of a spare '02 temp gauge sender and because I had a full electronic junk bin and more time than money, I custom designed a simple adjustable controller to trigger a standard automotive 40A relay. Though this is a very simple circuit, for fun I taught myself to use Eagle CAD software to create the schematic and lay out the printed circuit board that I then etched myself. The innards of the fan control unit. 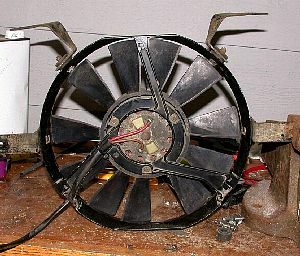 Because the fan draws so much power, it will need as direct a connection as possible to the battery and suitably-thick conductors. On my installation, the fan motor power comes directly from the main power distribution block (because I have relocated the battery) through an inline fuse (30A) in a weatherproof holder to the relay. Wiring is 4 gauge and the relay's normally-open contacts are rated at 40A. 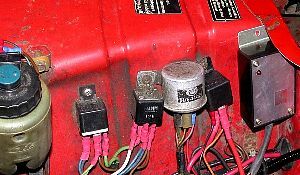 Power for the control module is taken from the horn relay circuit so that the fan switches off with the ignition but will run if the key is left in the accessory position and the radiator is hot. 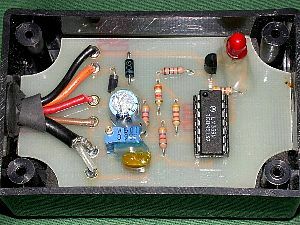 The fan's negative power wire is grounded to the chassis, near the fan on the front bulkhead. the voltage regulator used to be. Fan relay is closest to it. I'm not exactly thrilled with the Feng-Shui of this wiring, but it is functional and has proven reliable. One day, I'll find a small accessory fuse panel and will make a nice looking mounting bar for the extra relays - and use all the same style. This web site and all images Copyright © 2004 by Zenon Holtz, all rights reserved.